Wow, I can’t believe it is already Day 5 of this fun little cookie extravaganza. There is still time to join in and be entered into the prize drawing. Don’t be shy it is easy and your chances of winning a fun prize are pretty good! You can go here for more info. Did you know my favorite dessert is a warm, gooey, fudgy brownie? Mmm, add a little vanilla ice cream and some warm fudge sauce and I am in heaven. Today’s cookies remind me of brownies, little round, confectioners sugar covered brownies. I would suggest making the dough and chilling it in the refrigerator over night to make it much easier to handle. Mix oil, chocolate, and granulated sugar in a large bowl. Incorporate one egg at a time until well blended. Add vanilla to chocolate mixture. In a small bowl mix flour, baking powder and salt then add to chocolate mixture. Stir until flour is no longer visible and is completely mixed in. Cover bowl and refrigerate for several hours. If possible overnight is best. Roll cookie dough into 1 inch balls and roll each ball in confectioners sugar to coat. Place dough balls 2 inches apart on baking sheet. 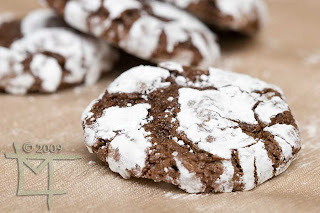 Bake 10 – 12 minutes, until chocolate cracks show through the confectioners sugar on the tops of the cookies. Immediately remove cookies from baking pans and place on wire racks to cool.